A unique combination of marine silicone and polyurethane, formulated especially for fiberglass. LifeSeal® offers a fast-curing, low odor, high adhesion, non-sagging, non-corrosive, non-yellowing formula. It provides a durable permanent watertight seal for joints subject to structural movement. May be used above and below the waterline. 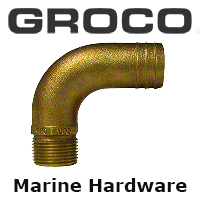 Use for sealing decks to hulls, thru-hull fittings, vinyl ports, sealing/glazing windshields and bedding marine hardware. Will adhere to metal, glass, wood, Lexan®, ABS® and certain other materials. Can be removed without damaging gel-coat. Not recommended for ferro cement hulls, impregnated wood or oil-soaked materials. Cures in presence of water. Mildew resistant and acid free.